I got interested in the stamps and postal history of Podillia in the 1990s when, by chance, I acquired a box of unsold lots and remainders from the 1986 - 87 Schaetzle auctions of the famous Vyrovyj collection. Eugene Vyrovyj had won many Gold Medals for his Podillia collection in the 1930s but though he committed suicide in 1945 the collection did not come on the market for forty years. In Imperial Russia, Podolia was a large guberniya to the south west of Kiev, bordering on Austria - Hungary in the west and Romania in the south. The population was very mixed, the majority ethnically Ukrainian or Jewish but with Russians and Poles too. It was also an economically lively region and when I first studied the Vyrovyj material I was struck by just how many post offices there had been in the Imperial period and still operating after 1917. Many of these offices were in small towns with large Jewish populations. Because of the extensive Internet documentation of the later Nazi destruction of the Jewish shteltls and populations of these towns, they are quite easy to research on the Internet. On modern maps of Ukraine, most of the towns still exist and mostly with the same names as in the Imperial period, though now with Ukrainian spellings - but it is nonetheless easy to locate them. When I made my collection of Podillia postmarks, I stopped in 1920. Today I was looking at a couple of later covers, both of which illustrate just how interesting this region can be to the postal historian. But then I noticed something much more interesting about this cover. 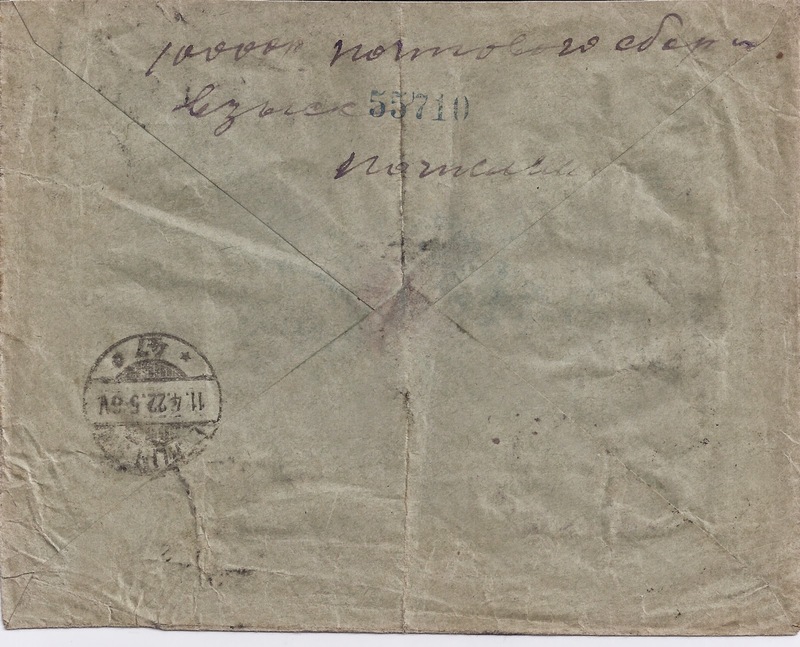 On the front the sender has marked it as ZAKAZNOE, but the actual post office Registry number is to be found on the back "N 337" and underneath, as you would expect for a Foreign letter, the place name in Roman script. 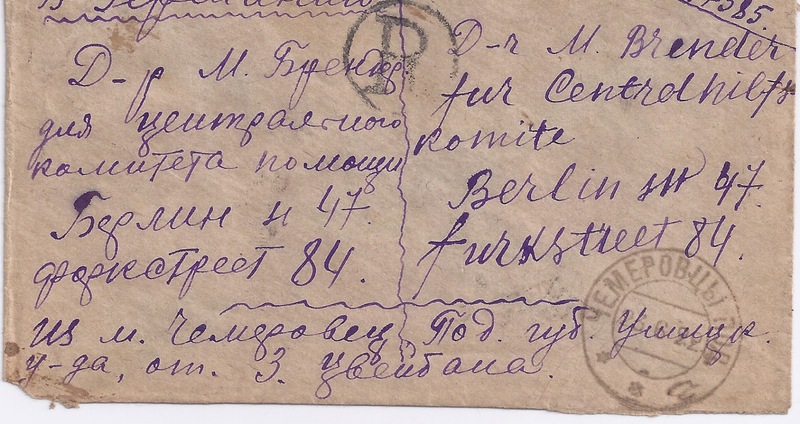 But look at the spelling - not Russian CHEMEROVTSI (as on the postmark), not Ukrainian either - but instead CZEMEROWICE which must be Polish ... and I think that's the first time I've seen a place name spelt that way by a Soviet post office clerk. 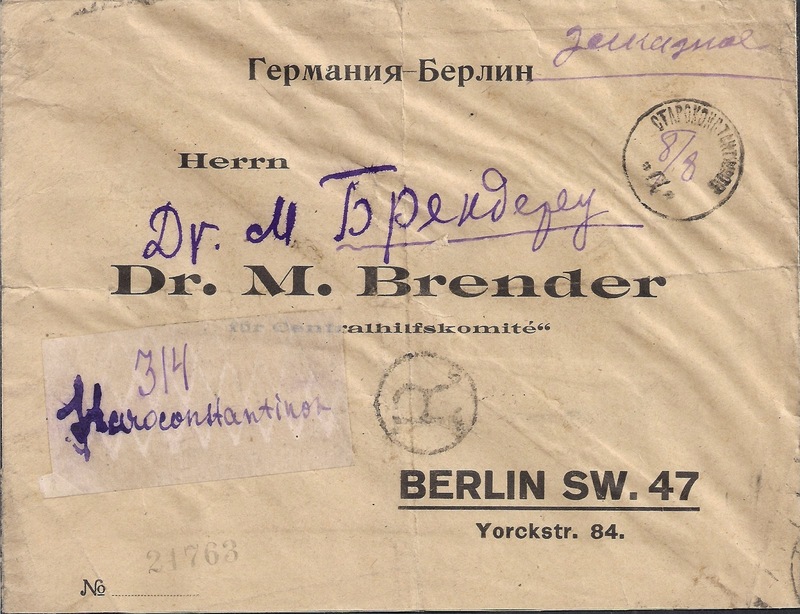 The second letter is another Brender cover, again Registered, and this time paid in cash at "10000p [roubles]" on 8 March 1922. Now 10 000 roubles is correct by the RSFSR Tariff of 2 February 1922 but that was replaced on 22 February with a 30 000 rouble Tariff. The most likely explanation is that someone got lucky - the old Tariff was still in use at this post office. 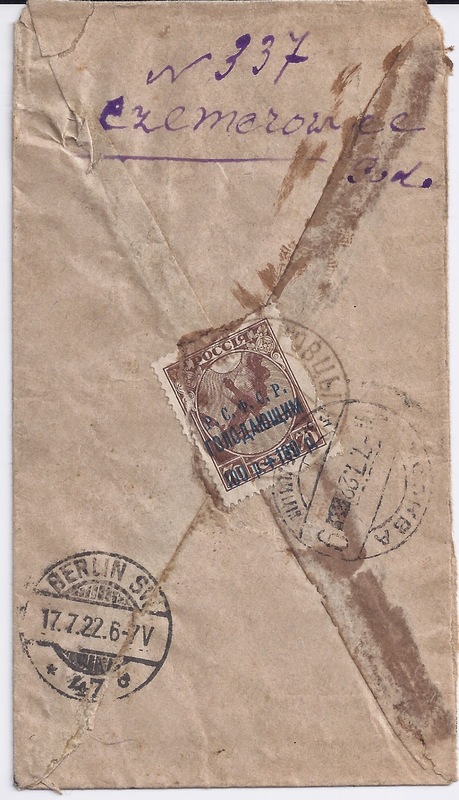 At the other end, in Berlin where the letter arrived 11 4 22, the Postage Due indicated by the blue "T" and Mss "1600" appears to have been cancelled. More interesting to me is the cancellation on the front STAROKONSTANTINOV "a" 8 III 22. This device is in a style I have not seen before and it is clearly provisional since the date is inserted by hand. 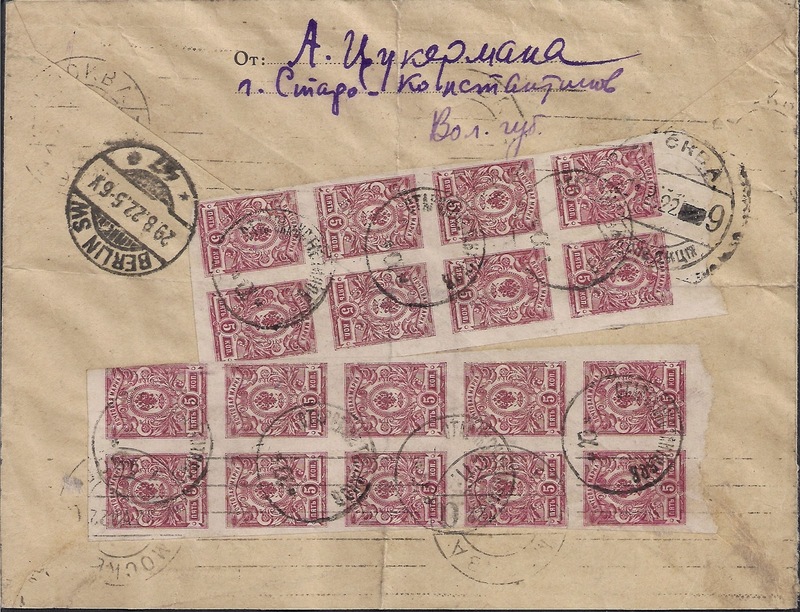 The Registry number 511 is to be found at top right of the cover front with "STARAYA" in Cyrillic underneath in the same violet ink. Someone has pencilled "Starokonstant" underneath the Cyrillic but whether this was a different post office clerk able to write Roman script or a later addition by a stupid collector, I don't know. Starokonstaninov is now Ukrainian Starokostiantyniv, south west of Zhytomyr. 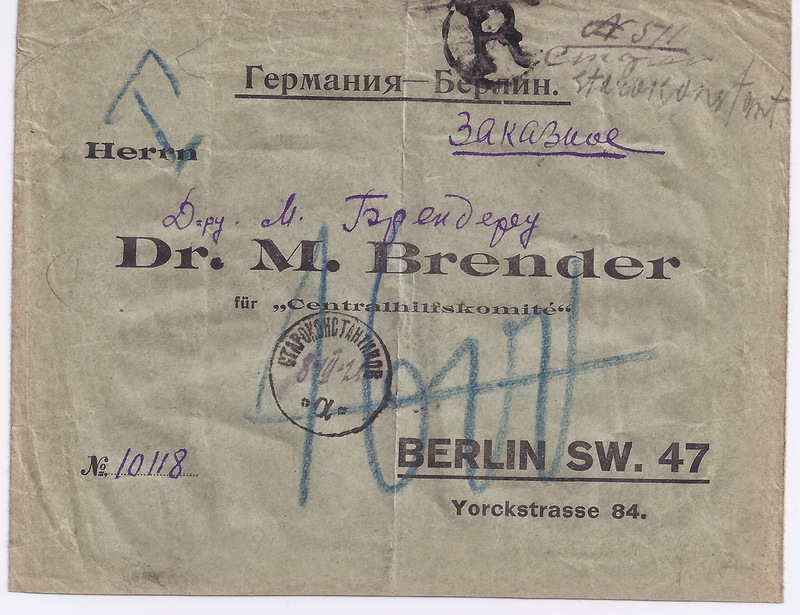 8/8/1922 Cover (Brender correspondence) from Starokonstantinov, Ukraine (now in Khmelnitskiy oblast, then in Volhynia) to Berlin (29/8), through Moscow (21 & 22/8). Franked correctly at the 90R rate with blocks of 10 and of 8 of the 5k imperf Arms. Note that the c”d”s of origin is an unusual single-ring one with just the town name and a large “a” at the bottom – the date is written in only once on the front of the cover (post-revolution – notice the absence of the hard sign at the end). The provo label is made out of a rectangular piece of paper (selvage of stamp sheet – notice the lozenges of varnish) with a manuscript notation “314 Staroconstantinov” in Latin script. (Starokonstantinov - Староконстантинов had a large Jewish population, in 1939 amounting to a third of the town’s total population of 20.000).